David Jeffrey. Pic by INPHO. David Jeffrey’s bid to “waken the sleeping giant” at Ballymena United will run until at least 2020/21 following confirmation of a two-year contract extension. The former Linfield manager has secured Ballymena’s first major silverware in 28 years, back-to-back top-six positions and European qualification since taking over at The Showgrounds in March 2016. He put pen to paper tonight on a two-year extension with the promise to continue that impressive progress, a belief backed by a string of summer signings. “To the chairman, vice-chair and the board of directors, I want to thank you very much for the appreciation, respect and belief you have shown to Bryan (McLaughlin) and I by extending our contracts even with a year still to run,” said Jeffrey. “Bryan and I are highly self-motivated with regards to our work and efforts to bring more success to Ballymena United, but to have this tangible encouragement from the club is a most welcome experience for us. “In our time here to date we have seen some success, however, we have always said that we are here to waken the sleeping giant and we aim to do just that. “Our job wouldn’t be half as possible to do without the backing of the supporters and what we have experienced over the past two seasons has been nothing short of phenomenal. Ballymena chairman John Taggart celebrated the news ahead of the club’s annual general meeting. 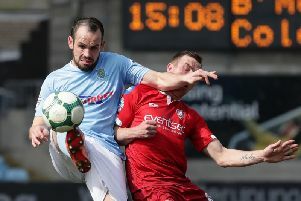 “I am delighted that David has committed himself to Ballymena United for a further three years from this date,” said Taggard. “David and Bryan are a top team, completely self-motivated and driven to obtain success for the club.